Wary of degradation from a slightly longer than ideal stint in the freezer, I wondered what to make with our last portion of last year’s skrei (beautiful Norwegian cod from the Barents sea). Fish pie was on my mind, but I didn’t fancy the cod and boiled egg fish pie recipe we have made previously; and with just short of 600 grams of cod, I didn’t want to make a mixed seafood fish pie either, though I’m sure salmon, smoked fish or perhaps some big juicy prawns would be a tasty combination. Instead, I remembered how much I like the combination of chorizo and cod in this baked chorizo, cod and potatoes recipe that we’ve made several times. An idle search on Google revealed surprisingly little variation in fish pie recipes, so I decided to go out on a limb and pull together a recipe using flavours I felt would work well together , even if no one else had combined them in a fish pie before – we made a chorizo, pea and cod filling topped with buttery mashed potato and it was marvellous; definitely one to make again! I used a full 200 gram Unearthed cooking chorizo, which was a generous amount. Reduce to 100 grams for just a hint of chorizo, 150 grams for a decent hit or stick to my 200 grams for a chorizo feast. We only had 100 grams of frozen peas left, but I’ll up to 150-200 grams next time, as per my original intention. Although cooking chorizo releases some oil as it cooks, I add more to the pan to ensure sufficient flavoured oil to make the white sauce. Cook chorizo and cooking oil over a medium flame until chorizo is just cooked through. Remove chorizo from the pan using a slotted spoon. 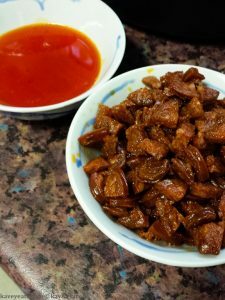 Pour chorizo-flavoured oil into a separate bowl or jug. Set both aside. Heat the milk in a saucepan and poach the cod over a low flame until cooked through, approximately 15 minutes depending on the thickness of your fillets. 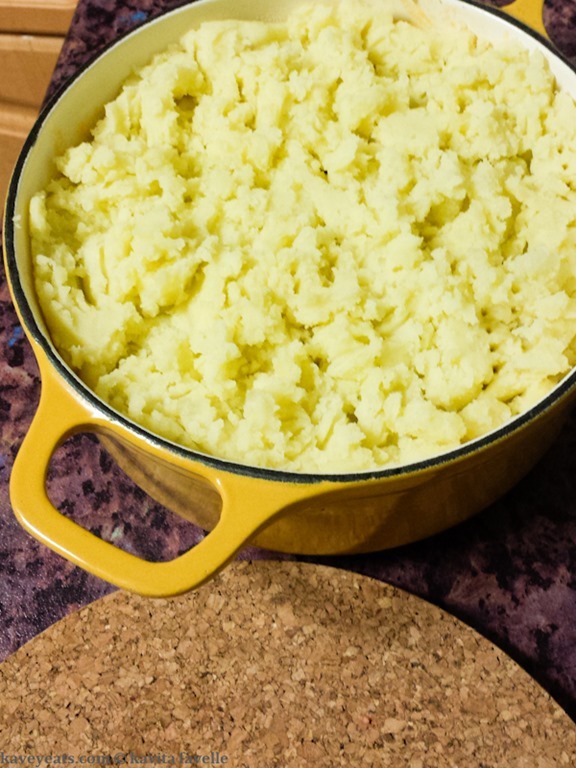 While the cod is poaching, put your potatoes on to boil, drain once cooked and mash with a little butter. Once the cod is cooked, strain the milk from the pan, set aside in a jug or bowl. Gently break the cod into small pieces, set aside. Combine 3-4 tablespoons of chorizo-flavoured oil with the flour and cook for a few minutes, then add strained poaching milk and simmer until the sauce thickens. Preheat the oven to 180 C (fan). 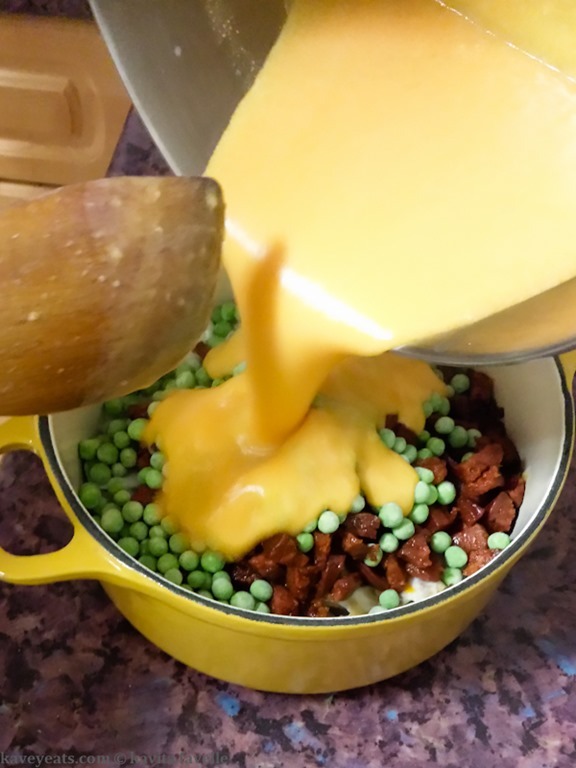 Place cod, chorizo and peas into a casserole dish, pour over the chorizo-flavoured sauce and gently mix to combine. Spoon the buttery mash over the pie filling and use a fork to create a spiky surface. Transfer to the oven and cook until the potatoes brown nicely on top, about 20-25 minutes. I think this recipe is a winner and I’d love you to give it a try and let me know how you get on and what you think! 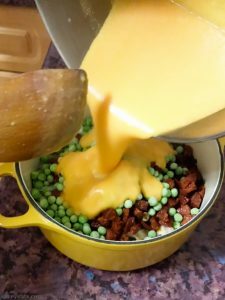 16 Comments to "Kavey’s Chorizo, Cod & Pea Fish Pie Recipe"
I am long over due to make a fish pie (or three for the freezer) and I love this twist with chorizo. Definitely something I will try out! Thanks Sarah, I really like chorizo with cod, and the peas give a fresh sweetness, not to mention getting in a portion of vegetables! Do let me know what they think if you make it for them! Aw man, this is the kind of food that makes me wish I had more fish eaters in the house. I might have to make a big batch and freeze it up! You could definitely divide the mixture into individual deep ramekins/ individual dishes. I would imagine it would freeze well and I’d certainly give a try on cooking from frozen, worth a try, right? We are massive fans of fish pie here and your version definitely appeals. I think the fish/chorizo combination is a wonderful one and one I use regularly in soups or stews, now we can try this delight. I’m glad you like the combination, I know some friends who are very anti. Hope you like it. I could dig right in Kavey and my OH would love it too. Hoorah, if you make it, hope you both enjoy it! I must try this one – it sounds amazing! 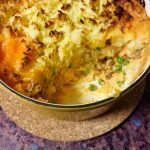 I love chorizo and putting it in a fish pie is an awesome idea! It gave such a pretty colour as well as its flavour and texture. 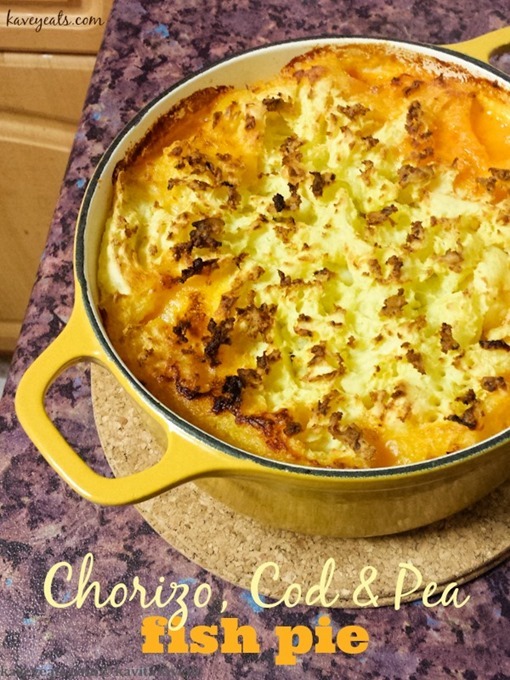 I adore chorizo but would never have considered putting it in a fish pie – inspired! Will definitely try this. Oh chorizo in a fish pie? I’ve added slices into backed fish and let it cook inside but never into a fish pie. For that purpose I’d definitely make sure it is iberico chorizo. the fat out of it is worth the extra cost. Good to know, thanks Claire!